"Drawing the anamorphic image is less unfamiliar than it would have been twenty years ago - we are accustomed now to using a mouse, guided by looking not at our hands but at a screen. 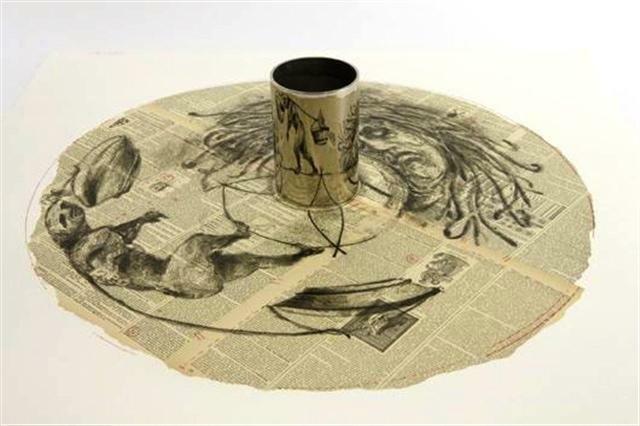 In the same waythe anamorphic drawing was made not by looking at the marks on the surface but at their reflection in the mirror-finish cylinder at the center of the (lithograph) plate. Medusa was of course someone whom it was safe to see only in a reflection, rather than directly." Anamorphic lithograph printed in three runs in black and red over chine collé of sheets from Le Nouveau Larousse Illustré Encyclopedia (1906) attached to a sheet of BFK Rives white paper, the flat image reflected in a mirror-finish steel cylinder that is placed in the center of the sheet, a fine, fresh impression of the only known state, executed in an edition of 60 (there were also proofs) printed by Mark Attwood and Joseph Legate at The Artists' Press, published by Parkett, Zurich and New York, in very fine condition.